What's a great way to wave your fandom flag for your favorite game? How about a t-shirt? They go with just about any outfit, are a great way to express your personality and sense of humor, and they fit into almost every budget! On the Gear store, tees are some of our best sellers and get the most feedback from the fans. One of the most popular programs is the Monthly Tee from the Vault program. Each month, the product design team tries to read the minds of the fans, and offer them a tee they would love to add to their wardrobe. This week, I wanted to chat with Patrick Combs and Sara O'Reilly from the product design team here at the Gear store, and learn about the design process for their tees and how they stay inspired....and I ended up getting a sneak peek at an upcoming design. There are a ton of talented designers out there, but it's a special breed of designer that is also a dedicated fan of the games they get to design merch for. The creative team at the Bethesda Gear store is just that sort of beast. For the monthly tees, they are committed to showcasing some of the deeper lore from the Fallout universe. You know, the images and stories that diehard fans only know about. 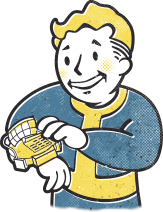 Other times, they are looking to tie the t-shirt designs to events that make the designs memorable or collectible for the fans of Fallout. Being fans themselves, they like to scour the in-game world, chat with the fans, and giggle at the memes flying around the web to help find their inspiration. Patrick gets his inspiration first and foremost from playing the games. He also spends a lot of time talking to fans and hearing about their wished and desires for cool gear. When asked about the fan creators, the team was quick to applaud their creativity and express how the fans raise the bar of creativity and drive the team to get outside the box with some of their ideas. The process for developing a t-shirt design isn't rocket science, but there is a fair amount of magic involved in the process. Once the team settles on a theme or idea, they start out with a set of basic thumbnail sketches to get a sense of the composition and how the art will sit on the tee. Many times, they work with assets provided by the game dev team. In those instances, a lot of work goes into recreating the artwork in a way that allows the image to work well with the printing process. When the images are full-on custom creations or only use in-game assets as inspiration - that is when the artists really get to shine. Once the artwork is final and approved, then the real work starts. Color separation is like crazy black magic to me. Taking an image that might be made up of hundreds or thousands of colors and figuring out how to print it in just a hand full of colors...and still keep the impact and vibrancy of the image is as much art as science. From there, the print vendor takes our digital files and sets up each color on its own individual plate for the print press and then starts putting color on fabric! Last week, Patrick was onsite with our print vendor in California and took a few videos so you could get a sense of the operation. Why do they run across the country to visit the presses? Because the are nit-picky to an extreme and want to make sure only the best quality hits the fans doorstep. Everything has to be top notch, and details matter just as much as the design. To that end, there are approvals at all stages of the process - culminating with the delivery of fresh-off-the-press tees that are inspected to make sure that every aspect of the body (the blank tee), the art and the printing are hitting the teams expectations. The product development team doesn't run around like a pack of rockstars. They are pretty lowkey and down to earth. About the most "rockstar" they get, is when they get snagged to do photo shoots for products. While photo shoots can be a lot of fun, they hate being in front of the cameras. But you know they are going to work hard to make the best designs possible if they are going to be pictured wearing them! And Patrick related on of his secret wishes that came true. He loves Harry Osborn's work and was stoked to get an original illustration. Patrick loved the power armor and flag juxtapositioned together and it made a great piece for a tee. #9 Monthly Tee from the Vault! This months Tee from the Vault features Sunset Sarsaparilla - the perfect drink for quenching your thirst while wandering through the Mojave Wastelands. This tee is only available until 3/4/2019, 2pm MST. This past week, I've had a bunch of fans sharing their Fallout gear collections with me on social media. It's been astounding to see some of the collections. One fan had nearly every tee of the month going back for years! If you want to show off your collection, make sure you tag BethesdaGear and use the hashtag #MyFalloutGear so I can find your stuff.